Imagine our surprise! 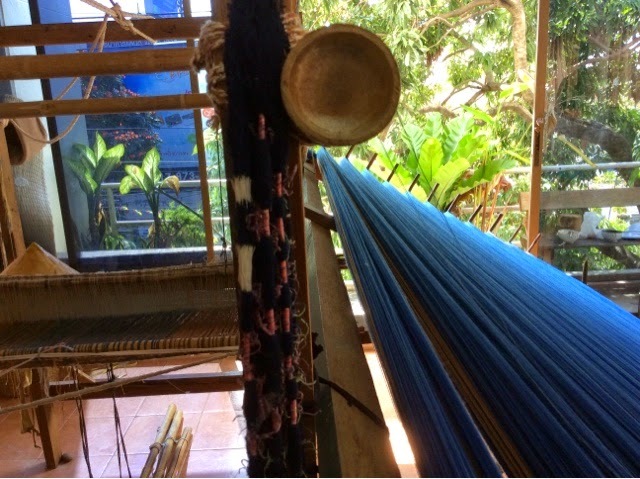 Visiting the Hilltribe Museum in Chiang Rai, Thailand today, we encountered handwoven, flowing scarves, dyed with indigo and mango, in cotton and silky cotton-rayon blends. Unlike the backstrap looms favoured by tribal weavers, the "parrot beak" pattern gracing these pieces require the comb and heddles used on the floor looms traditionally used by lowland Lao and Tai weavers. 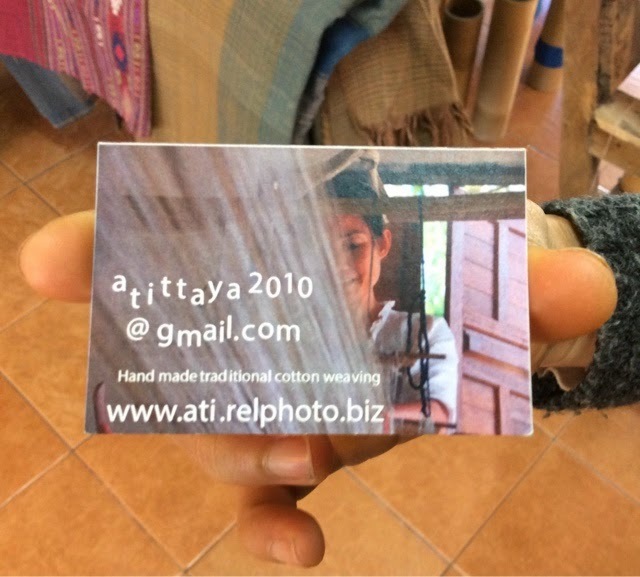 Not surprisely, the designer/weaver/dyer, Atittaya, is originally from Sakhon Nakhon where we purchased these styles in the past. Atittaya says she puts her heart into each piece because she loves this work. 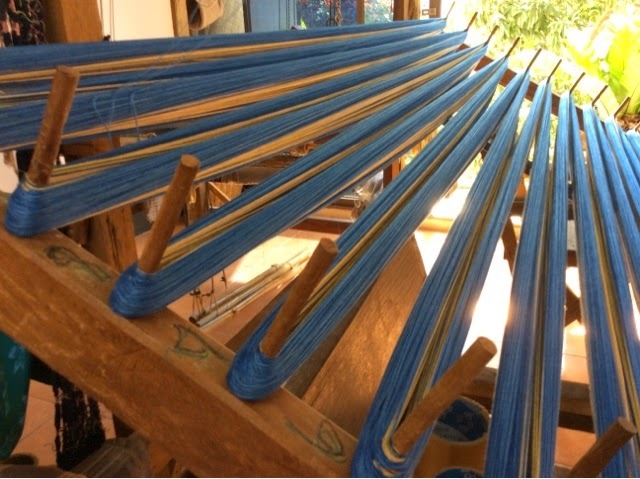 If she feels good, she will weave; if she's not feeling calm and meditative, she'll do some dying or wind bobbins. It's easy to see her feelings when you look at her scarves, bags, blankets and even dresses. 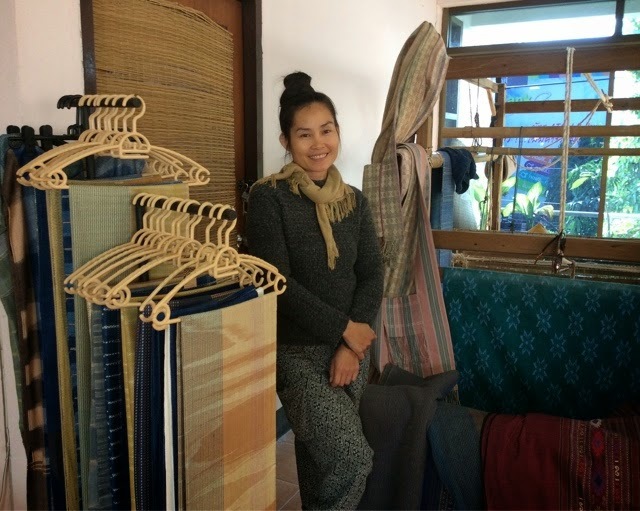 Long-time TAMMACHAT customers will recall the indigo scarves with deep colours and a wonderful drape: the ones we brought back in 2008 that quickly sold out. The good news is these are available now in Chiang Rai! Do visit. The Hilltribe Museum is a public-benefit organization which aims to help educate local and foreign tourists about Hilltribes' fast disappearing culture. The Museum aims to preserve artifacts and to provide information to tourists and tour operators so that responsible tourism can occur. When people are informed about Hilltribe culture, it is hope that negative impact of tourism on Hilltribe life will be minimized. The Hilltribe Museum is under the supervision of the Population and Community Development Association.